Confession time. How often do you eat lunch at your desk? Or staring into your phone? Since you’re eating anyway- let’s get together and make it productive and fun. Our lunch and learn events feature 3 of our very own members who have 10 minutes each to share information on their business topic of choice. Enjoy your lunch, learn something new, and network to grow your business! Speakers: Steven Li is a full time professional photographer and videographer at Steven Li Photography. "I’ve been in business for 5 years and I specialize in photography for businesses like headshots, personal branding, real estate, food, product, events and social media. I also do video marketing. Today I’m going to be talking about the importance of a professional headshot and some tips on how to take a good headshots. Some topics we’ll cover includes: - Why your headshot matters - How a headshot affects your brand - How a headshot can help you get more business - What to wear for a headshot - How to pose for a headshot - Other things to consider with a headshot" Jake Turner - Sommelier WSET Jake has 5 years experience in retail and political activism. Through the political lens, he has come to learn much about the regulations effecting many industries including his own in liquor retail and how to bring forth the possibility for change to these regulations through the political sphere. Alongside retail and licensee business dealing with restaurants observing his superiors work with such, he has come to understand the balance between mass and niche marketing Jake will to speak on unconventional tactics to business development and understanding the multitude of factors that go into building and maintaining a business. His key point is to know that there are many moving pieces to any business, both internal and external; helping people become cognizant of some of these factors and how they could effect their business. Paula Goebel - Professional Speaker and Corporate Trainer Topic TBA Door Prize: I'll be giving away a free ticket (value $50USD) to our next online workshop! Lunch is NOT provided at this event. Please order lunch and support the establishment that is hosting us. Fionn MacCool's is happy to offer our entire group 10% your bill! Interested in speaking at a future lunch and learn? Contact me about your topic – which must have real content that adds value to our audience, though you are welcome to promote your business at the end. After our three speakers, there is open networking time for you to share and grow your business. Bring your business cards! Space is limited for Entrepreneur Fridays! Reserve your spot today! As always, if your circumstances change and you can no longer attend, please update your RSVP on Meetup to allow another member to have your spot. See you soon! Looking for good conversation with like-minded business owners? Want to avoid the usual pitch-fest at other networking events? Join us at our next Open Networking night! The 2nd Wednesday of every month. This is your chance to become part of a rapidly growing networking community. We're a diverse group of entrepreneurs dedicated to serving our clients with authenticity and helping each other grow our businesses. 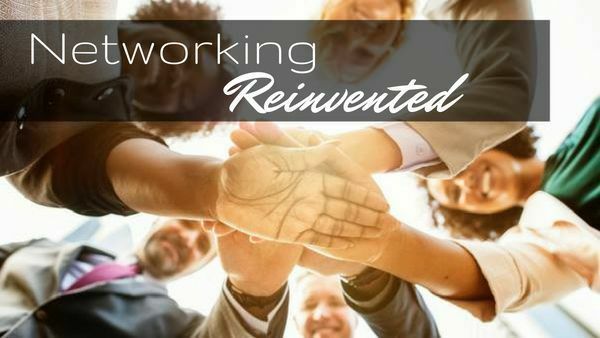 Whether you've been in business for years or are just starting out, drop in from 6-9 p.m. for fun, facilitated networking themed around authenticity in business. Please plan to purchase dinner or (at least) a beverage to support the establishment hosting our group. We expect this evening to sell out so please register early. Please be respectful of others - if your RSVP changes, change it on the Meetup group to allow space for another person to take your place. We look forward to connecting with you! Do you run a small business? Do you want to connect with other business owners, share your experience, and mastermind business challenges together? Join us for Entrepreneur Fridays, the last Friday of every month! Whether you've been in business for years or are just starting out, join us for coffee, tea, networking, and a roundtable chat about marketing and growing your business. Each event we feature a different theme related to small business ownership. Today we will be discussing Spring Cleaning Your Business! If you struggle in this area, or if you excel and have some tips to share with the group, come and join us! Come with a story to tell. We'd love to hear about your business values, and your ideal clients. Find out how other businesses are building relationships with their clients. Pick up new ideas to boost long-term client retention, share referrals, and exchange business cards. You MUST purchase ticket and RSVP on Eventbrite (RSVPing here only does not reserve your seat): https://www.eventbrite.com/e/roundtable-mastermind-spring-clean-your-business-tickets-59612461477 There is a coffee machine available that offers coffee, cappuccinos, lattes and hot chocolate. Tokens are available for purchase at reception for $1.00. Spaces for this popular event are limited. Reserve your spot early to avoid disappointment!